Calling all caffeine fiends! 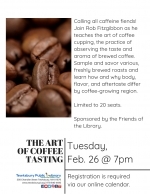 Join Rob Fitzgibbon as he teaches the art of coffee cupping, the practice of observing the taste and aroma of brewed coffee. Sample and savor various, freshly brewed roasts and learn how and why body, flavor, and aftertaste differ by coffee-growing region. Limited to 20 seats. Sponsored by the Friends of the Library. Capacity: 3 of 24 spaces available.